Shopping online has become a common habit in our society. More and more people choose their products online and have become accustomed to this new practice. 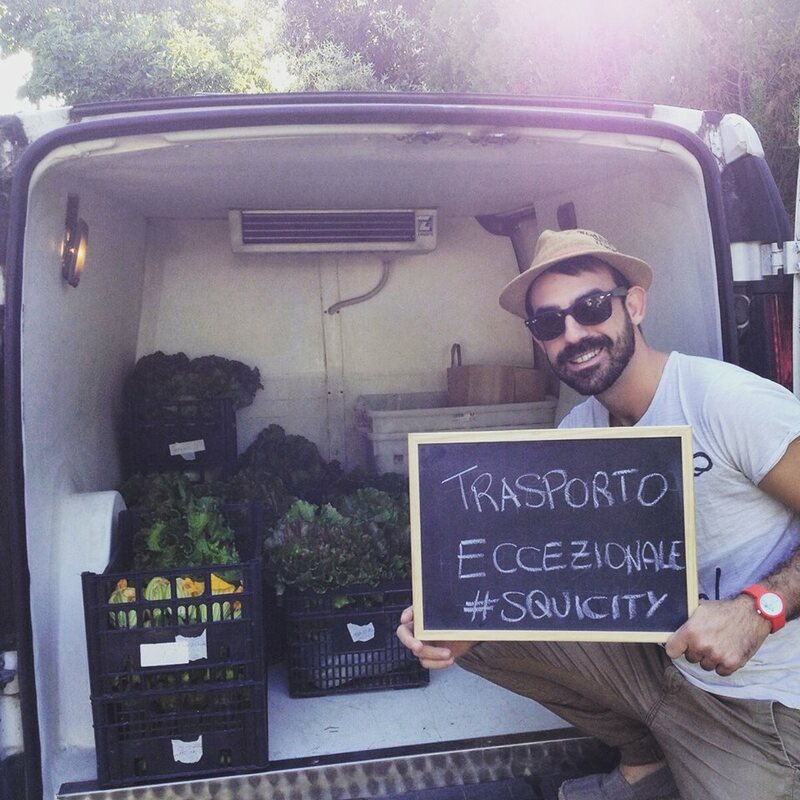 Squicity uses the virtual platform to offer to Roman consumers the products of their land, exclusively grown in the province of Rome, Rieti and Viterbo. The following interview features Alfredo Morales, one of the founders of Squicity, who explores the limits and potentialities of such an online commerce dwelling on the unpredictability of the web and on Squicity’s interest to take part in the regeneration of markets in Rome. Squicity is fundamentally an e-commerce. Our project was inspired by the ideas of three agronomist who have been working for years in agricultural technical assistance in the upper area of the Lazio region. We became conscious of the necessities of both consumers and producers to benefit from a more immediate access to local food, a food that is more traceable. Working with this idea, thank to our knowledge of the Lazio territory and its producers, we designed a platform through which the consumer can shop directly from the producer, choosing the products they need and receiving them at home in all comfort. It is a service conceived to favor all of those people who want to make a life choice and buy their food directly from the farmer, in a society in which you normally don’t have the possibility to do so. In a city like Rome for instance, this would mean traveling 40 km to go buy some lettuce or wait for the Coldiretti market on saturday or sunday. Thanks to Squicity, the consumer chooses products online with total transparence and receives them at home weekly. How does the delivery work? What are the steps necessary to deliver your products? We receive the online order and proceed to contact the producers chosen by the client. We often deal with orders that involve three or more producers for instance. The next step is organizing the pick-up and home delivery route. Since we don’t use storage, we pick up fresh produce in the morning from the producer and deliver it during the day. For the packaged products instead, like dry beans, tomato sauce, home brew and olive oil, we arrange small monthly or biannual storages according to the type of product. It is a very short supply chain. The delivery mechanism is fast. Producers and consumers are both situated in an area of 150 km, in the provinces of Rome, Rieti and Viterbo. We have made an effort to follow the practice of avoiding storage for fresh produce. The consumer appreciates these efforts and recognizes the value of freshness. A salad that was harvested in the morning and delivered home two hours later is definitely different than the produce one finds in supermarkets. What makes your project unique, compared to other Roman initiatives like Zolle? First of all, the possibility to choose freely. For instance, in contrast to Zolle (even if they adopted it later), we have set up a system since the beginning that would best resemble the client’s standard habits in a supermarket. Without offering a pre-composed package, we offer the client to choose our products freely. Secondly, we offer the local dimension. Our competitors often select products from diverse locations without strictly choosing local producers. We chose to be exclusively tied to the Roman territory for two reasons: because we work and provide technical assistance to producers in the area, we work as agronomists, and work in the countryside. Only one of us is completely dedicated to Squicity’s project, although we all contribute. We therefore selected a production on a land we know, a land on which we work everyday. This provides us with a big advantage as far as the product quality is concerned. We can claim a sort of auto-certification for the products. In three years of activity we have almost never received a complaint. Moreover, we support producers and help them create a product that is more marketable, improving the packaging and the logistics for instance. Yes, this is a very important aspect of our project that makes it unique. We use the online platform only as a showcase, as if it was the shelf of a supermarket. It is an innovative and fast means to send the order and to provide information about a product, which in turn facilitate our job and the client’s decisions. The web also helps us through marketing and advertising. But on top of all of this, we founded our project on human relationships. Since the beginning, we have always attempted at recreating the old relationship between client and shopkeeper, who used to be a familiar and trusted figure. Indeed, one of us is completely dedicated to our clients and knows perfectly its demands, creating the same confidential relationship one could once find in neighborhood markets. We have a close relationship with both consumers and producers and this is what Squicity was established on. Due to a generational gap, older people, who might need home delivery, are not always comfortable using web services. What are the solutions you suggest to overcome such obstacle? Our older client is 84 years old. She orders weekly groceries by phone. In fact we also receive orders by phone or email, but we still prefer working through the web. The main problem is raised by cases in which clients don’t have access to internet connection. How can these people reach our services? In the past we tried to meet this phenomenon by promoting our services through leaflets advertising. Thanks to this initiative the older age range was also able to get in contact with us. As of today the evolution would definitely be that of providing clients with a physical multifunctional selling point. We started off with online services in order to create a very light structure without fixed costs. We in fact work at home via IPad and we don’t have actual offices. Even the billing system is online. There are definitely advantages as well as disadvantages. For instance we have low management costs that are strictly related to daily activities only, such as delivery. However we are not easily reachable, not having a shop we cannot meet our clients in a specific space. Thus the evolution we are aiming at is to create a multifunctional space that would help us being in direct contact with the people and that would also serve as the starting point of our delivery services. We are also very fascinated by the idea of entering a market. A physical Squicity point would not only be dedicated to selling activities but would also foster the interaction with other vendors, transforming the market into a hub for home delivery in Rome. As long as customers are concerned, who are they and where are they from? The most receptive age range goes from 30 to 55/60. Our clients are mainly women. In fact women’s groceries shopping is usually more continuous, concrete and basic. Men, on the other hand, spend more and order more sporadically. As long as social classes are concerned, we usually work with people from the upper middle class. Talking about numbers, the minimum expense is 30€ while the average receipt is of 60€. In reality we deal with a specific cultural rather that economic class. The totality of customers are all very attentive to the food issue, trying to take informed choices. There is a big difference between shopping online and shopping at the market. The main difference is in the starting point. In a market clients can check on what they are about to buy whereas online shopping is based on the information you are given by the vendors. Similarly, shopping on the Squicity platform is based on the information we provide on the production process. It is a reality that requires the population to make a huge step in order to fully understand such an innovation in the market. As a consequence, the profile of our client must stand within a certain cultural class, able to take the step. Squicity also differs from its competitors in terms of delivery services. We chose not to entrust the merchandise to bellmen but to commit a team of agronomists to deliver the products. The main idea at the core of this choice is to build a relationship of trust with the consumers. Indeed, when the products are delivered the clients can express any kind of concerns to the agronomists who will answer according to their skills and professional knowledge. Going back to the possibility of including Squicity in a neighbourhood market, it would also mean to us the deepening of our knowledge and the upgrading of our services thank to the comparison with our fellow market operators. As long as producers are concerned, what are the credentials according to which they are selected by Squicity? We mainly deal with non-industrial producers, for big distributions work along a logic of low costs at the expense of quality and environmental impact. Thus, we select small producers that operate in the area we are more familiar with, meaning in the provinces of Rome, Rieti and Viterbo. Among the producers we prefer those who run closed-cycle farms, in which all stages of the chain take place in the same farm. Such a choice depends on the higher degree of products traceability. We thus always provide our clients with a vast choice of certified biological products. What are the challenges that Squicity will face in the near future? Squicity is open to any opportunity of improvement. Our future challenge is definitely to add a physical dimension to the virtual one. Moreover, we are very interested in the dynamics of neighbourhood markets and we would be very keen on participating in such realities. In this regard, we were recently contacted by Confesercenti, who were offering us the possibility of providing our home delivery services in neighbourhood markets. However such an initiative is harder than it seems and we faced many obstacles. On the whole our main goal is that of designing a Squicity point, for it to be a reference to us and to the overall market. We believe that a transformation in the organization of markets and the services they provide should happen soon. A market should be a place in which people can buy products and consume as well. As we can see, today’s successful market model is that of shopping centres, in which people can spend a whole day if they wish. We don’t think markets should reach that stage, but at least they should convert into public spaces in which consumers can also have lunch and drink coffee. Economy, Environment, Rome , agriculture, commerce, delivery, food, market, mobility.